Simple lines surround this beautiful blue and white cabochon. 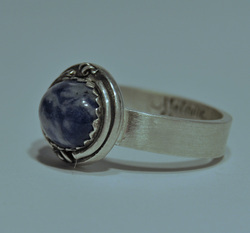 Sodalite is a beautiful, mottled stone, thought to promote inner peace and athletic endurance. This is a ring you can wear every day! A gorgeous original design, handmade in my studio. One of a kind, generous size 7, and can not be sized. HOWEVER - as with all of my work, I am happy to create a similar ring for you in another size.